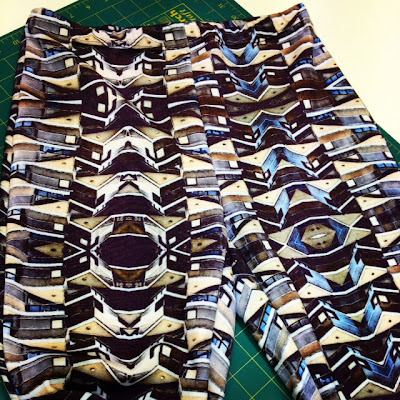 This tutorial is to show how the elastic band is attached to the waist tunnel on our latest Anita Ponti Pant pattern. This method is great for knits and ensures that the elastic band doesn't twist in the casing. Note: this method should only be used on stretch knit garments. Using the elastic measurement guide included in the pattern or measure and cut 2.5cm (1" wide) elastic to fit firmly around waist. 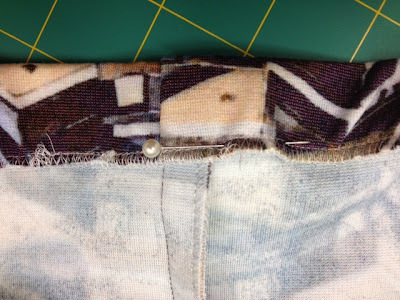 Overlap at ends (approx 1/2") and sew to secure. 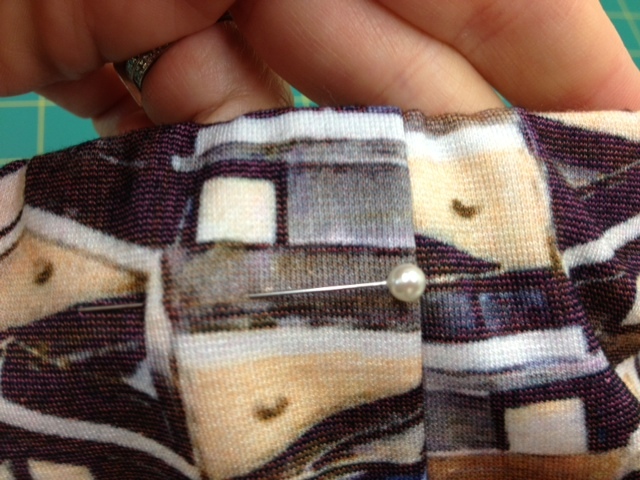 Quarter the joined elastic by placing a pin at each quarter. 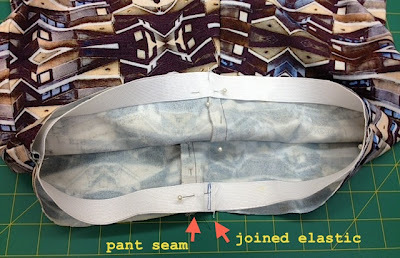 Pin the joined elastic around wrong side of waist, lining up edge of elastic with raw edge of waistband and matching up quartered elastic points with quartered points on waistline e.g. front and back side seams and crotch seams. We recommend the elastic join sits at the middle back seam. So as to avoid too much bulk at the seam where this join is, when lining up joined seam of elastic with a seam on pant, you can move the elastic join to just left or right of the seam and adjust your other quarter points accordingly. Your elastic band will be smaller than the waist in between quartered points. 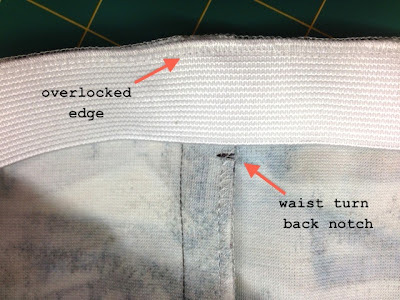 Next, *overlock the top elastic edge to the raw waist edge on pant, stretching the elastic between the 4 quarters to fit onto the waist edge, this will ensure that the elastic is sewn and distributed evenly. Note: Making sure not to cut off the edge of the elastic, you can lift the blade up out of the way at this point if you wish. This is what it will look like from the right side. 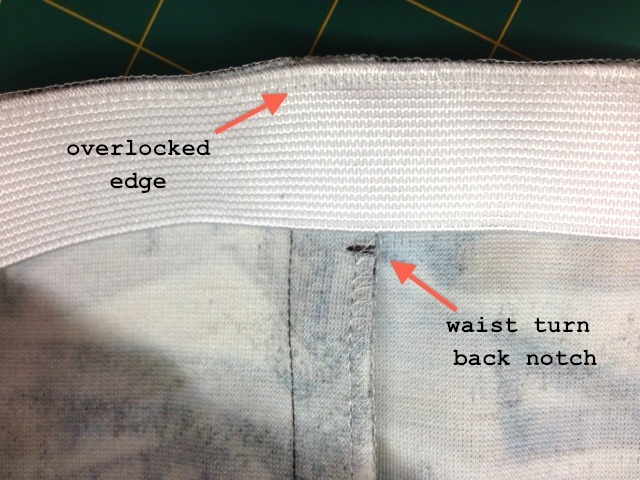 With the elastic now securely in place, turn over top overlocked edge towards inside (or wrong side) of pant. 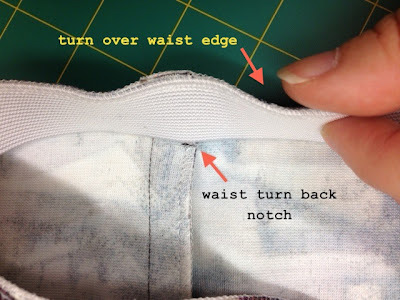 Note: your waist turn back notch should be just below the bottom edge of elastic). 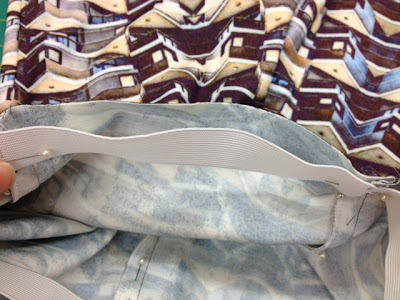 Making sure that the elastic and fabric sit flat and even, pin in place at overlocked edge and then transfer pins onto right side at the same point. Note: Set your sewing machine up with the recommended 4.0 stretch twin needle. With the pins in place (or use guide line on your machine) as your guide, twin needle at this point on right side of pant around edge of waist. 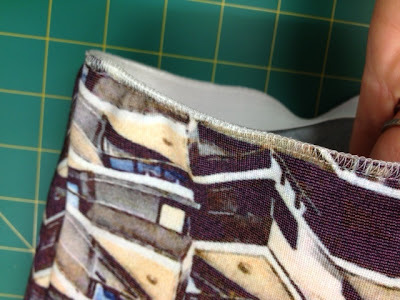 As you sew, you will need to gently pull/stretch the fabric through from behind your sewing foot with your left hand and guiding in the fabric with your right, ensure that you you keep your fabric casing flat and that you sew evenly as you do this. Back stitch at end. Note: The twin needle stitch at this point gives a professional finish to the pant. When sewing through all the thickness (elastic, pant and casing) as well as stretching your casing as you sew, it's very important to sew slowly and carefully when using the twin needle. 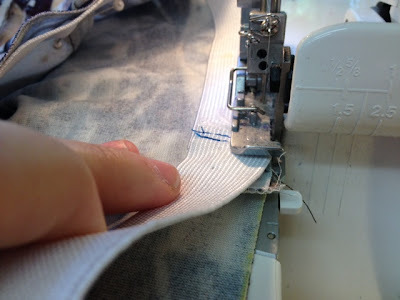 - You can use your hand wheel, in particular when sewing over bulk eg. 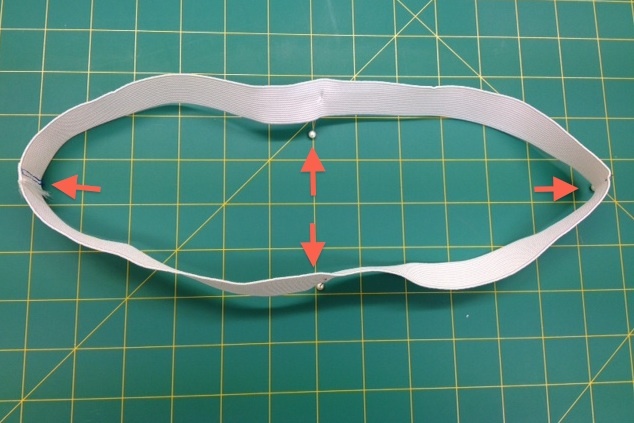 joined elastic thickness. 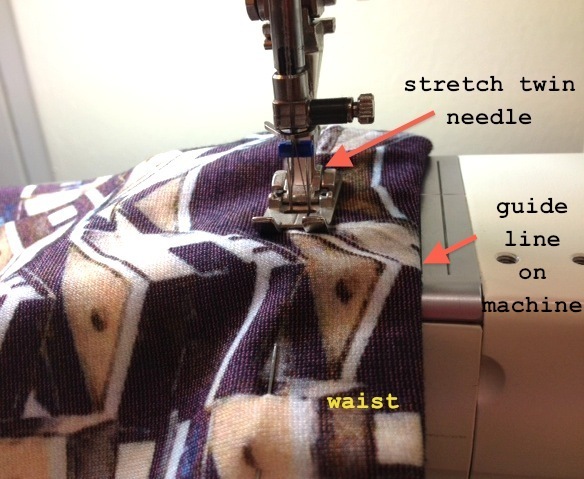 - Increase the length of your stitch, this will help keep the stretch in your elastic. - Using stretch woolly nylon thread in your bobbin gives extra stretch to this area. Normal thread in bobbin works fine too. 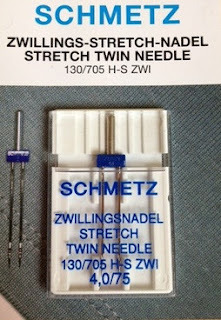 - For those not keen to try twin needle stitching you could sew with a normal needle (stretch 90 or jeans 80 / jeans 90 - yes really, a jeans needle! They are a sharp and tough needle that will go through elastic and fabric thickness) and sew a double row finish instead. Hope you've found this tutorial helpful. 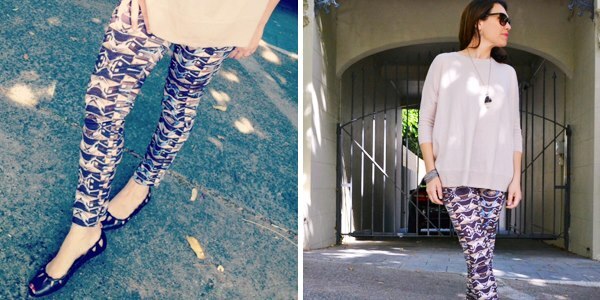 If you've got any suggestions or tips to add we'd love to hear them.